I wish I had a before picture of this fabulous little chest. One day when picking up a Craigslist find, the woman said she was trying to get rid of everything in the house, already had a yard sale and everything left was up for grabs. One of those items was the aforementioned chest. I couldn't believe nobody had snatched it up before. Of course it was covered with a swirly mixture of forest green and black paint, but the lines, people, the lines! So I took it home, sanded all of that disgusting paint off and painted it my signature chocolate brown color (seen here, here, here and here). Then I covered some wrapping paper I had on had with some clear contact paper to make it more sturdy and mod podged it onto the front door and top drawer. 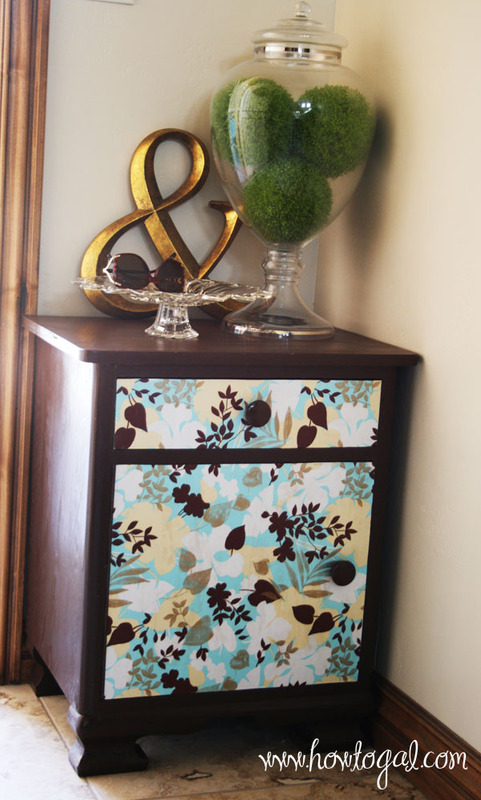 I also painted the old drawer pulls I had kept from my Vintage Desk Transformation the same chocolate brown, screwed holes through the door and drawer and attached the pulls. Not bad for a free to fabulous transformation if I do say so myself! !